Truth be told, I sometimes get angry (relatively speaking) when I pop over to Zara's site for one piece to put in a story and discover that it has what seems like thousands of brand-new arrivals that I can't help but spend the next 20 minutes scrolling through. But shopping is my job, so I always power through (tough gig, I know) in search of all the hidden gems that are worth calling to our Zara-loving readers' attention. It never ceases to shock and amaze me how many stellar under-$50 pieces Zara always has in stock, and those are often the ones I choose to buy (because, cheap thrills). Among the current inventory, I found leather sandals that made my jaw drop, tons of special dresses, expensive-looking accessories, and so much more. So before you fall into a Zara rabbit hole, scroll through this story to shop the under-$50 Zara pieces I'd buy right now. 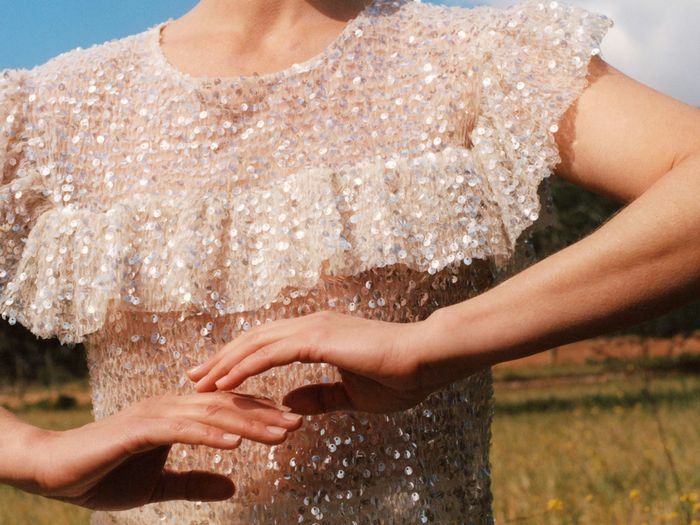 As you can see in the intro image, this top is ridiculously pretty and ethereal. This is one of the prettiest tie-dyes I've seen. These are the sandals that made my jaw drop. This hoodie is just genius. Your transitional wardrobe needs this jacket. I've seen comparable earrings that are retailing for hundreds more. Take my advice, and order this immediately. There are so many good bike shorts out there right now, but these are tough to beat. This is what I call conversation-starting fashion. If happiness were a shirt, this is what it would look like. Four hair clips are better than one. Wear this with other neutrals for a very 2019 look. Chanel vibes, Zara price point. These hit on so many trends right now. A French graphic top that actually isn't cheesy. I'm tempted to buy multiples of this. All of your outfits just got chicer. I predict the fashion crowd will fall hard for these. This is ridiculously easy to dress up or down. Wear this with the aforementioned bike shorts (or the matching track pants). Bags that are devoid of hardware always look more expensive. This pale yellow is currently trending, FYI. It's time to stock up on easy, breezy tops. These are worth taking a break from hoops for. A flattering wrap dress but also a mood booster. Next up, the $60 Zara shoes that made me forget about the $400 designer pair I wanted (seriously).